Discover a chic, comfortable home base for your Cambridge adventures with one-of-a-kind style that feels fresh and new. All of the bedrooms at Freepoint Hotel Cambridge, Tapestry Collection by Hilton feature elements sourced from the local area: original artwork, sophisticated furnishings, and unique decor. 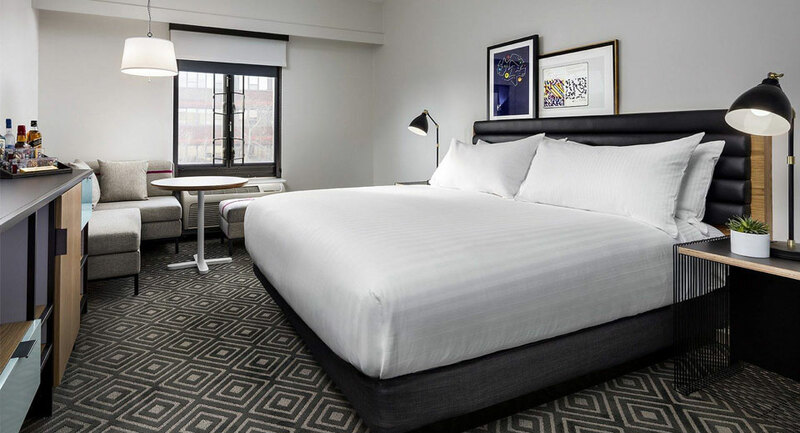 Our rooms wouldn't make sense anywhere but right where we are: minutes from Harvard Square and just across the river from Beacon Hill and Boston Harbor. Our hotel rooms are just a short walk (or free shuttle ride) from the Alewife Train Station and hop on the Red Line to reach Harvard Square, Kendall Square, and Davis Square. Immerse yourself in the vibrant, youthful energy of our historic neighborhood. It's packed with great restaurants, interesting museums, fun shops - and a few very famous universities. Ignite your Boston adventure today at Freepoint Hotel Cambridge!